Private Bertha Joyce House WF96798, Casualty Clearing Station. Corporal Herbert Geoffry House 29231, RAAF 17 Repair and Servicing Unit. Private Victor Clarence House WX15518, 2/24 Battalion. Leading Aircraftman Douglas Henry House 29532 RAAF. Private Roy (Strawb) Leonard House WX14784, 2/28th Battalion. Private Allan John Kidson WX15346, 2/11th Battalion. Army Prefixes WWII, W - Male did not leave Australia, except New Guinea, WX - Male or Female that served overseas, WF - Female did not leave Australia. National Service & Vietnam era numbering, Army and Air Force numbers, the first numeral (i.e. 2/771128 or A55100) usually indicated the State in which the trainee was called up: 1 Queensland, 2 New South Wales, 3 Victoria, 4 South Australia, 5 Western Australia, 6 Tasmania and 1 (later 8) Papua New Guinea. First scheme Army numbers had an oblique, Vietnam-era numbers did not. 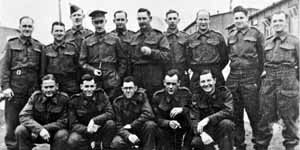 The Australian Army recruited seven Garrison Battalions (1st-7th) from veterans of the First World War in October,1939 and by January,1940 there were eight such battalions with a strength of 4,967 men. Find out who did what in the war. The best WWII 2nd AIF and ACMF site I have found. Very comprehensive, covers all wars Australia has been involved in. Has any one got any stories about the A.C.M.F. Garrison Battalions (Dad's Army Battalions) ? Example of "Dad's Army", but there must be a lot of embellished stories out there. Cowra Breakout - Armed with a wide assortment of weapons, including knives, one group attacked the crew of a Vickers gun that was stationed outside the camp. Members of the 22nd Garrison Battalion opened fire, causing a large number of casualties. During the ensuring nine days 334 prisoners were retaken, of which 25 were dead. Of the dead, 11 were found hanging from trees and two had been killed by trains. In all, 231 Japanese POW's were killed and 108 wounded. One Australian Officer was killed along with three Australian other ranks, while four others were wounded. This made Cowra the largest POW breakout, eclipsing other well known Break-outs such as the "great escape" from Stalag Luft III. You can send a message to Australian Soldiers serving in Australia's Armed Forces. All messages will be forwarded.